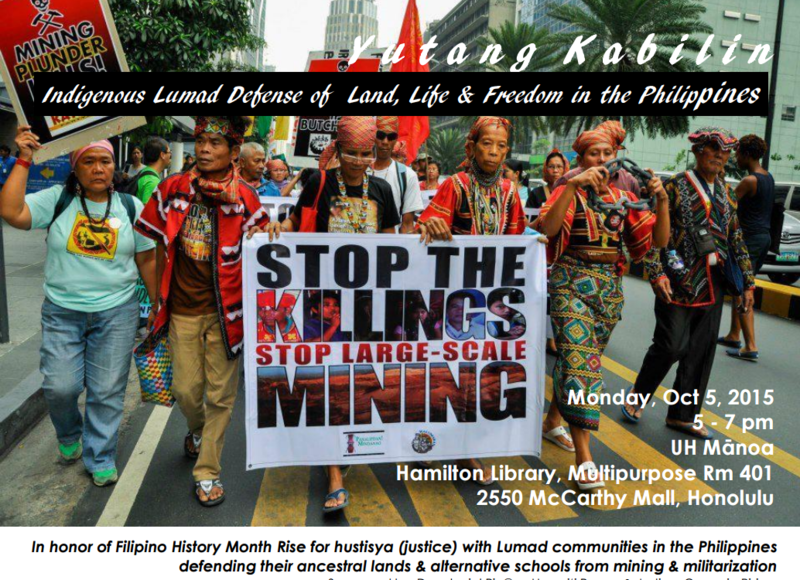 Attorney Reyna Ramolete will speak at Hamilton Library, Asia Multipurpose Room 401, Monday, October 5 at 5 PM, on the Lumad killings in Mindanao, Philippines. The Lumad are the indigenous people of southern Philippines. Reyna is a local born Japanese/Filipina lawyer with the Legal Aid Society of Hawai’i. She also has experience with nonunion labor organizing in upstate New York. She went with a solidarity delegation to the Han-Ayan area in Mindanao on December 2014 and was at the Alternative Learning Center for Agricultural and Livelihood Development (ALCADEV) that was destroyed by paramilitary troops on September 1, 2015. The lecture will also be an occasion to launch a “Save Our Schools” campaign to build solidarity among several community-based events in the Philippines and Hawaii. This event is sponsored by Decolonial Pin@ys, Hawai’i Peace and Justice, Oceania Rising, UHM Hamilton Library, Women’s Voices/Women Speak, and UHM Center for Philippine Studies.